A great prediction effect, for kids and adults! 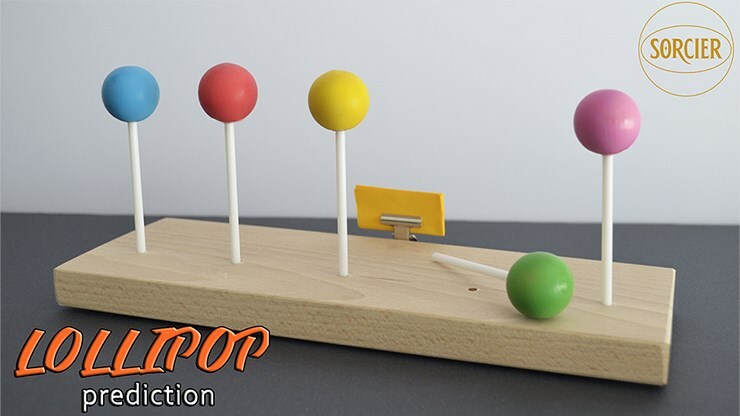 A wooden base is presented, holding five lollipops - each with a different color and taste. A prediction is fixed to the wooden base with tweezers. A child or spectator is invited to take a lollipop. After having discarded it, the magician shows that his prediction is correct. The other lollipops are discarded to show that the tastes and colors are indeed different. Measures 11 x 26 cm. The base is made of sturdy and resistant wood. The lollipops provided are colored and very similar to the real ones to last over time.